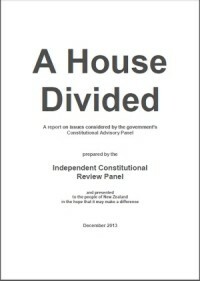 We have pleasure in presenting A House Divided, the newly released report by the Independent Constitutional Review Panel (ICRP) – it can be viewed and downloaded on our website HERE. The ICRP was convened in October 2012 when it became clear that the Maori Party was using the government’s constitutional review in an attempt to entrench the Treaty of Waitangi into a new written constitution as supreme law. With no other groups campaigning against this major threat to our democracy, the ICRP stepped up to the challenge. We are pleased to see the government’s Constitutional Advisory Panel (CAP) has now expressly ruled out recommending a new written constitution as supreme law for New Zealand. In a report to Cabinet issued last week, they said, “There was no significant support for a supreme fully entrenched written constitution, which empowers judges to strike down legislation and that can only be amended through specified processes.” While we can claim some success for uniting opposition to the Maori Party’s proposal, close reading of the CAP report shows there is no cause for complacency. As the ICRP chairman David Round has observed, their approach replaces “instant execution” with “death by a thousand cuts”. Far from diminishing, the CAP report shows that the threat that radical Maori separatism will be entrenched into New Zealand’s future constitutional arrangements is now very real. If the government is foolish enough to establish the long term independent working group that CAP has recommended – to continue on their constitutional ‘conversation’ – then it is highly likely that the extremely radical and divisive ideas outlined in their report will be given credence and treated with a respectability they do not deserve. Such suggestions include changing the makeup of Parliament to reflect the 50:50 representation model desired by the iwi elite whereby half of the MPs would be Maori and the other half non-Maori, the establishment of an Upper House of Parliament based on the 50:50 model, and the introduction of independent tribal self rule. Taken together, the full range of proposals in the CAP report are odious and ominous. In fact CAP has suggested that the Maori seats should stay in place for as long as their proposed working group continues on the ‘conversation’ about the future of our constitution. With the Treaty settlement process, that has been used to justify the need to retain the Maori seats now drawing to a close, iwi leaders have been casting around for a new excuse. CAP has just delivered that with their recommendation for a constitutional conversation that may never end. With regard to Maori representation on councils, CAP has described the present arrangement, whereby local government is free to set up its own mechanisms to fulfil its obligation to consult with Maori, as “undesirable”. They want more formal arrangements prescribed, and have suggested the 50:50 Waikato River co-governance arrangement – with half Maori and half non-Maori representatives – could provide a model for local government in the future. Unsurprisingly CAP categorically rejected the flood of calls by submitters for the abolition of race-based council representation. Ominously, they have suggested that our successful unwritten constitution should be re-written into a single statute to make it “more easily accessible and understood”. Such a move would enable references to the Treaty to be inserted into a new written constitution, ready for entrenchment into supreme law at a later stage. CAP has also recommended a significant broadening of the Bill of Rights to include “economic, social and cultural rights, property rights and environmental rights” – a move that would enable the Treaty to be included under ‘cultural rights’. They have suggested this amended Bill of Rights should be entrenched and that the power to assess new legislation for its consistency with this expanded Bill of Rights should be removed from elected Members of Parliament and transferred to the Judiciary. Since this would enable Judges to strike down laws proposed by MPs, it represents another serious attack on the sovereignty of Parliament. In addition, using the Bill of Rights to give the Treaty of Waitangi constitutional recognition would create a two-tiered society – a privileged Maori elite, with all other New Zealanders relegated to the status of second-class citizens! They also want to see Maori representation in Parliament improved – in spite of the fact that the continued existence of the Maori seats has resulted in a serious over-representation of Maori MPs. Some of the radical suggestions for increasing the number of Maori seats in Parliament include changing the formula that calculates the number of Maori electorates, re-aligning Maori electorate boundaries to match tribal boundaries, and making it compulsory that anyone with even a smidgeon of Maori blood is registered on the Maori roll. The 12-member Constitutional Advisory Panel was hand-picked by the Maori Party in 2011 using the iwi elite’s 50:50 co-governance model to significantly over-represent Maori. Their ‘engagement’ period, which ran for five months, prioritised consultation with Maori. Panel members attended 120 meetings with selected organisations, but held no public meetings. Some 5,259 submissions were received. It is important to remember that the government’s constitutional review was not driven by a constitutional crisis, but was the result of a political deal – a demand made by the Maori Party of National in 2008 and 2011 in return for coalition support. Their plan to use the review to pave the way for a Treaty of Waitangi constitution might well have succeeded – if it hadn’t been for the New Zealand Centre for Political Research. The NZCPR’s role as a “watchdog” over Parliamentary and political affairs is a crucial one. With a firm belief that informed citizens are at the heart of a well-functioning democracy, the NZCPR aims to provide quality research and analysis on policy issues of national importance to draw public attention to matters that might otherwise ‘fly under the radar’. The Maori Party’s constitutional review was one such issue. With no real opposition to their attempt to introduce the Treaty into the constitution, the NZCPR convened a panel of experts led by David Round of Canterbury University as Chairman, along with Professors Elizabeth Rata, Jim Allan and Martin Devlin, NZCPR Research Associate Mike Butler, and myself, Dr Muriel Newman, to monitor CAP’s activities and undertake our own review. Once it became clear that the consultation programme being undertaken by CAP was favouring iwi and other supporters of their race-based agenda – and that most New Zealanders had no idea the review was underway – we launched a fundraising appeal for a nation-wide public information campaign. We ran advertisements (see HERE) in the country’s leading newspapers to informing New Zealanders that the government’s review was underway and to encourage them to send in submissions. The response to the ad was overwhelming. Submissions flooded in and CAP was forced to extend their submission deadline by a month. Without our efforts to raise awareness of the review – and the ambitions of those driving it – CAP’s recommendations to Cabinet could have been quite different. Submissions have also played a key role in the review conducted by the ICRP. Over 1200 excellent contributions from the public have been received, and the information contained in these submissions has been incorporated into the ICRP’s report, A House Divided. We believe it is a very significant work and we urge you to not only read it, but to help us to promote it as widely as possible. The ICRP report confirms there is strong public opposition to race-based representation in Parliament and local government. Submitters are adamantly opposed to the Treaty of Waitangi – or its principles – being part of any constitutional arrangements. They are opposed to the idea of re-writing our constitution into a single document and they strongly support the sovereignty of our Parliament. Submitters overwhelmingly believe that major constitutional change should only occur with the express approval of citizens through a binding public referendum. “Nations can fail, and they can be brought to their ruin by policies entered into with the highest motives. The road to hell is paved with good intentions. New Zealand’s history has not been without injustices, although they are often exaggerated. But whatever justification there may have been in the past for Treaty claims, the Treaty industry is now the self-perpetuating vehicle by which a small greedy and power-hungry clique practices a gigantic con-job on the people of New Zealand. It is time ~ it is long past time ~ that we shake ourselves free from the baleful spell the Treaty industry has cast upon our nation, and calmly and clearly assess the good and ill it has actually done. We must assess where we are, and examine the ways ahead. We would like to thank everyone who contributed to the constitutional review process. From those who sent in submissions to CAP and to the ICRP, to those who have helped to raise awareness of the agendas driving the attack on our constitution, and especially to those who so generously supported our public information campaign fundraising efforts and enabled us to make a real difference. If you would like to support the NZCPR, to keep us running for another year, please click HERE. Do you think the government should set up the new working group recommended by CAP to keep the conversation about the constitution running indefinitely?